St Marys Church, Wargrave, was rebuilt after a fire in 1914 which destroyed much of the building. However, the first mention of a church at Wargrave is in 1121, and it is likely that the family worshipped here from at least the fourteenth century. Certainly for hundreds of years they were main fillers of the parish registers, during which time they were also Church Wardens. 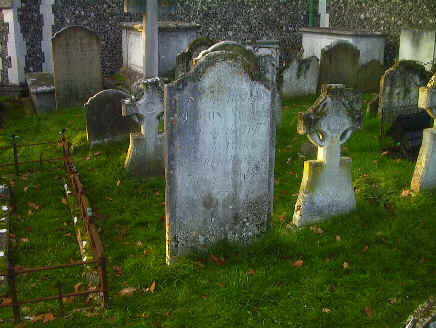 There are six known burial plots, all close to the church building. 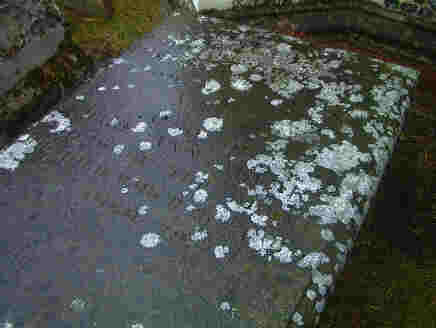 The oldest grave is that of John ABear who died on 20th July 1771, aged 73. He was the only surviving son by his fathers first marriage to Grace Gunnell. (His fathers second marriage to Ann led to six more children being born). It was this John who married Alice Whitfield in 1744; and through this marriage that the ABear fortunes were to change. Alice Whitfield (born Alice Burton) was a wealthy widow of a prosperous land agent and speculator. John and Alice had three children. The eldest of these, another John, was born one year after their marriage, and married Mary Newell in 1767. 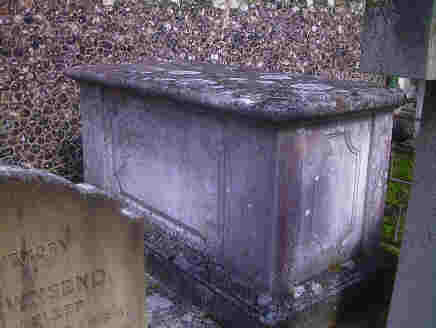 John died in 1795, aged 50. Of John and Marys five children, two sons are also buried here. 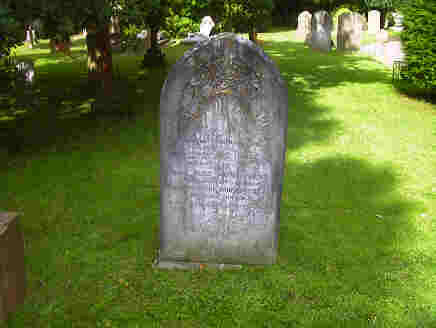 One son, another John, died at the age of only 34 in 1819. Mary lived to the age of 77, dying in 1828. Their youngest son, John Newell ABear died in 1840 at the age of 53. 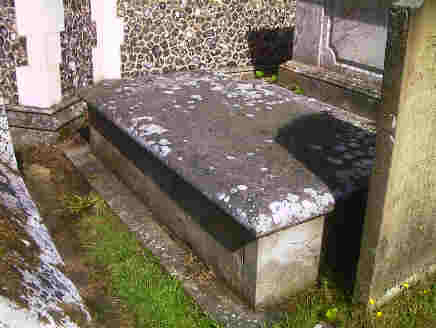 This tomb is a Grade II listed building. For further information see John ABear (1745  1795) gen 10A, John ABear (1784  1819) gen 11A & John Newell ABear (1785  1840) gen 11A. Though the elder of these two sons only lived to the age of 34, he married Sarah Stevens and had three children. All three survived, his second son being named John Burton ABear. John Burton was born in 1816, and married Jane Ann May in 1855. Their offspring numbered nine, but their third daughter, Alice Jane, died at the age of only 8 years 11 months. 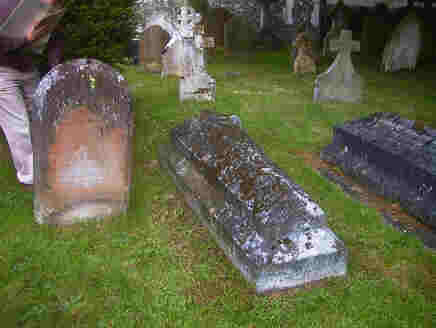 In this grave lie the daughter, who died in 1876, and father who died in 1881. For further information see John Burton ABear (1816  1881) gen 12A & Alice Jane ABear (1867  1876) gen 13A. 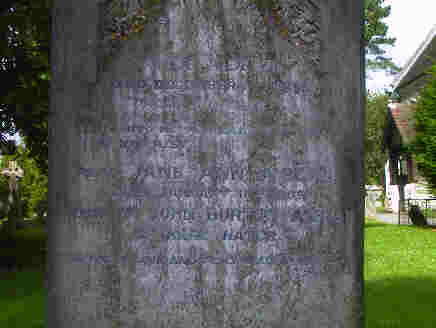 For further information see Alice ABear (1818  1895) gen 12A & Jane Ann ABear nee May (1832  1909) gen 12A. The John ABear who married Mary Newell had a younger sister and brother. This brother (another John Burton) had five children, the second son being named Edmund Whitfield ABear. Born in 1779, he married Mary Ann Bowlby on 25th October 1813. 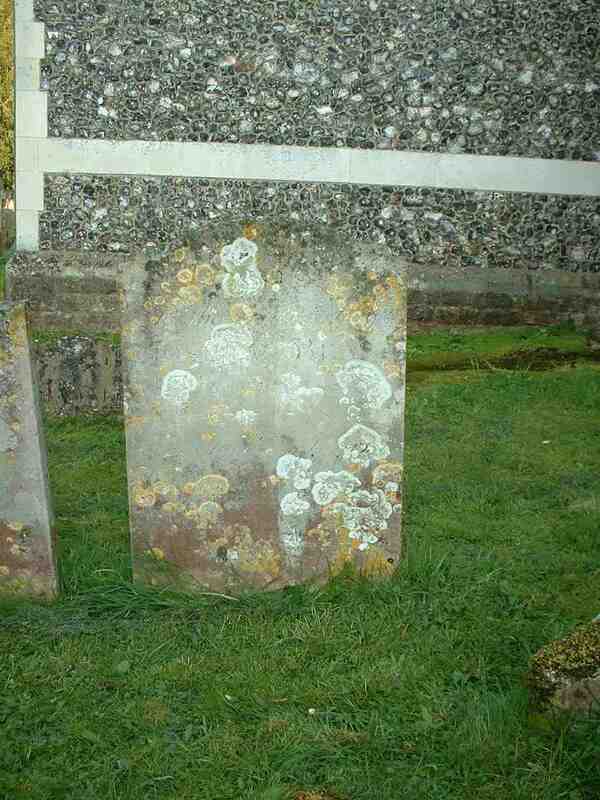 This grave is that of Edmund (who died in 1856) and Mary (who died in1869). For further information see Edmund Whitfield ABear (1779  1856) gen 11A. The most recently discovered grave is that of Joshua A'Bear. 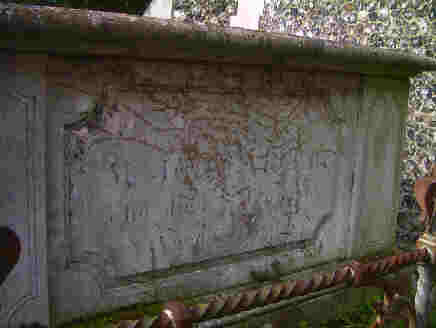 This grave was believed to be that of Joshua Beard, but close examination, later supported by family papers, gave us indisputable evidence. Joshua was born in 1757 and is most likely the youngest son of Caleb A'Bear of Gibstude Farm. Caleb and his family were stricken with misfortune throughout their lives. At the time of Joshua's death, his only living relative was his sister Diana who paid for his burial. 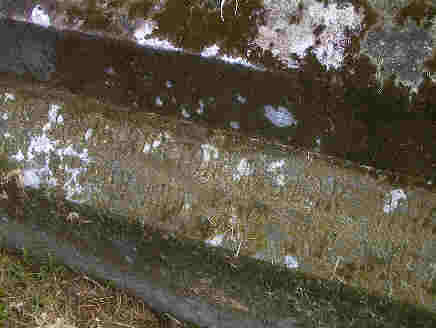 This grave is to the North side of the church, halfway between the vestry door and the North porch on the left side of the path (next to William Butler d.1809 aged 23). For further information see Joshua ABear (1757  1800) gen 10B. John Abeare (1576  1647/8) gen 4J.